The Chair asked LMA to provide details about how it proposes to approach property acquisition outside of the project boundary. A more detailed account of this is reported by The Age. Rod Mclelland and Vibeke Pederson spoke on behalf of the University of Melbourne Baseball Club. The Club was established in 1926 and has been based at Ross Straw Field since 1977. The Club requires two fields closely located for its continued operation. Pederson says Ross Straw Field was named after a significant baseballer, and the field was the first purpose built all weather baseball diamond. The club agrees with the comments of Nesbitt, LMA’s expert witness on social impacts that the performance requirements do not include tangible targets or outcomes for stakeholders. Pederson says “for us the reference design … involves permanent loss of both of our baseball grounds”. LMA and the City of Melbourne have agreed to move the club to an area between Elliot Ave and State Netball and Hockey Centre, although this area will not be available for five years given this is within the construction zone, and may be subject to cut and cover. The club may be temporarily located outside of the City of Melbourne and this will impact on recruitment of new players and impact on competitiveness at the top levels. The club is also concerned about the quality of the build of any new facilities and require that they meet the current ground performance.The club requests that performance requirements be made clear and enforceable. Les Potts, President of the Flemington Association spoke next. The association was formed in 1881, incorporated in 2009 and has approximately 400 members (and many more followers on social media). Potts refers to the experts who have already spoken, especially those from Moonee Valley and Moreland and aims to pick up on some local issues which have not been covered. On the Flemington, Newmarket and Travancore area, Potts says has 3 times the rate (compared with the average) of households with no car and 20% more kids. Potts showed a picture of Mooltan Street Travancore which will have 1200 trucks during construction. Potts says the project is a yes or no decision, but mitigation is not and can be proportional to impact. He says of the CIS information, he would have liked to have seen how many people will benefit, rather than number of trips. Potts says experience of freeway works indicates that Public Transport patronage rates dramatically increase during these works and questions whether the PT network has that capacity considering current PT performance levels, where the Craigeburn line has a 40% rate above benchmarks. Experience of CityLink – where mitigation measures were not delivered to the same community – means that the community is wary. The Flemington Association supports MVCC recommendation to reject project planning approval. Potts says many residents in the Flemington area are skeptical of performance requirements and guarantees because “we lived through CityLink”. He says the consultation has been at best a one-way process, and explains why so many community groups and individuals are wanting to present at the hearings: “This is the first chance the community has had to make their concerns heard which is reflected in the number of people wanting to present at the hearings” Here’s a photo of Les Potts standing with Kaye Oddie who will be presenting later today for the Friends of Royal Park, Parkville. 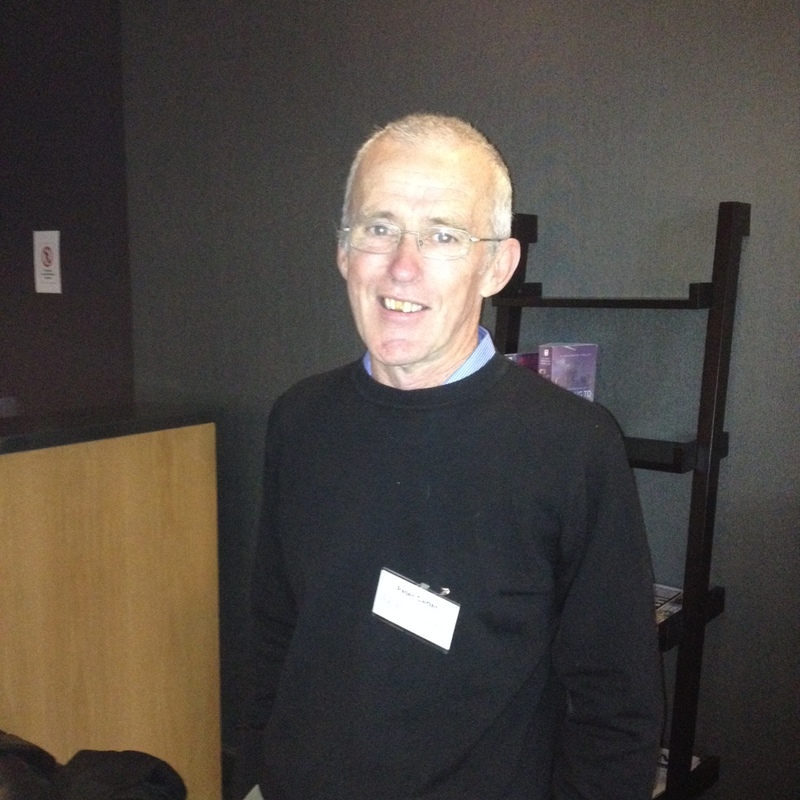 Peter Carter (pictured above) was one of the speakers presenting on behalf of the Boroondara Bicycle User Group. The group has proposed a bicycle corridor (North East Bicycle Corridor) they believe should be included as part of the project. The group presented a detailed description of their proposal, which you can read about in their submission. The concept proposal presented a new infrastructure transport project – safe separated bike routes. The proposed design creates a quicker safer route with options for crossing over the Yarra, Merri Creek etc. Proposing a route through the Hoddle St interchange. Geoffrey Warren, Principal and school council members Melanie White, and Nicholas Reece spoke for the Clifton Hill Primary School (pictured in the screen shot above). Geoff Warren commenced the presentation by saying “48 hours ago we celebrated the 140th anniversary of the opening of our school”, “today the school is highly regarded in its local community” and “we pride ourselves on our inclusiveness”. The school conducted an online survey of parents which received 213 responses. 72% of respondents do not support the design of the proposed East West Link. 86% were concerned about traffic, noise and vibration, air quality. After the construction phase these concerns only reduce marginally. Parents said they wanted the school to focus on minimising disruption during construction, air quality monitoring, shifting the emissions tower and tunnel entrance further east and stopping the tunnel altogether. The school has received and seen conflicting information from LMA on the location of the proposed emissions stack, one showing the stack at 80m from the school, another plan showing it further away. White reads an email from a parent who chose not to accept a place at the school due to the proposed east west link and concerns about their child with asthma, about which White says “this email breaks my heart”. Reece outlines the omissions in the CIS regarding affected schools. He says no schools at all are mentioned in chapters on air quality, noise and vibration, environmental management, or regarding the obligations of the successful tenderer. Reece seeks assurances that air quality will not be worse than current levels, and that access will be maintained. Warren closes by saying “It would be an outrage … to agree to position an emissions stack within close proximity to the school community”. He talks about students at the school with asthma and says “To place these students at risk … would be irresponsible in the extreme”. Smith is speaking on behalf of both the Kororoit Institute and the Moonee Points Creek Co-ordination Committes. He says the project and Plan Melbourne have been “co invented”, there is no separate reference point for these documents. 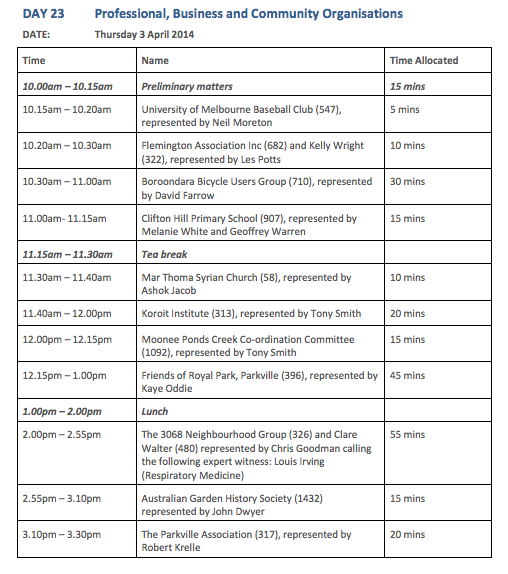 Contrasts consultation by SPI Ausnet on Moonee Ponds Creek to LMA lack of consultation. Kaye Oddie and Gordon Ley presented for the Friends of Royal Park. They say the objective of the group is to protect and enhance landscape character, biodiversity, habitat and indigenous flora and fauna. Oddie says the Friends of Royal Park are concerned that the CIS fails to understand the history and significance of the remnant vegetation site with its naturally occurring regeneration over 50+ years. She says surveys indicate 53+ indigenous species of plants. The site acts as an important component for the increasing indigenous flora and fauna. The EWL will impact on that biolink diversity. Refers to the Victorian Government recommendation to “protect native vegetation on public and private land by amending the permitted clearing regulations”. White Skink Habitat – the population in Royal Park is considered highly significant and any reduction in habitat will bring about a rapid and irreversible decline of the population. Does not support the proposal that a 50% reduction in the site could be supported, or the site could be moved. Trin Warren Tam-boore Wetlands – treatment and storage ponds. The wetlands are logically sited and cannot be moved. They provide an excellent habitat, open space for recreation, social benefits such as health and wellbeing. Aboriginal Cultural Heritage – Archaeological works have been undertaken but not information has not been released. The group rejects the proposal that Royal Park can be compartmentalised and losses localised. Friends of Royal Park believe the EWL is invasive, destructive, detrimental and will cause irreversible damage. Ley requests the panel consider the implications of the proposed ‘cut and cover’ process in their own local park and requests that Royal Park – one of the green jewels in Melbourne – not be subjected to ‘cut and cover’ process. Clare Walter represented the 3068 Neighbourhood Group. Clare is a Pharmacist at the Peter Macallum hospital and a mother of 2 girls. Health impacts of project are the focus of the presentation. Air pollution is a known cause of cancer and therefore increasing traffic should not be allowed and the CIS is flawed in regards to quantifying the risk of the project. Particulate matter – key pollutant, trending up not down. Small particles <1um are trending up even though absolute emissions have gone down due to Euro standards. More harmful as it travels further in the body. Diesel is now a class 1 carcinogen. 300 cancers / 1 million pop / 1ug/m3 of increased pollution (USA) – occurs at lower air pollution levels than Melbourne currently has effects can be felt 100m way. However, small particles can travel more than a 1km. Atlanta Olympics – prevented cars and level of admissions to hospitals due to respiratory conditions declined greatly. Location of stack at eastern end has been moved 200m to east since the LMA response to Directions but contractor could put it anywhere. Sensitive receptors in the area including school and child care. Modelling for stacks done at 20 degrees C but plumes sink at 35 C so what happens on hot days? Project to be regulated based on opacity in tunnel and not on the reduction of particulate matter that has been shown to cause health impacts. Professor Irving presented Expert evidence to support Ms Walter and made reference to the National Environment Protection Measure (NEPM) for Ambient Air Quality. Acute exposure to air (traffic) pollution can be experienced by the broad population and not just the more vulnerable members of our society resulted in out of home cardiac arrest. Morwell fires have indicated that the length of time exposed to pollution leading to chronic conditions may be weeks rather than months. Adverse health effects occur at levels below the current standards and it could be concluded that there is no safe lower limits, particularly for the smaller particle such as PM2.5 and PM0.1. Whilst the EPA reports PM10 figures over a 24hr or annual basis etc, we do not know how the biological system of humans is affected by peaks and therefore the focus should be on reducing all emissions to improve air quality. Under cross examination by Mr Morris, Professor Irving was advised that he was not aware that Australia has the most stringent air quality standards in the world for PM2.5 but Professor Irving was not aware of this. Professor Irving suggested that there are only 1 or 2 stations across Melbourne and so even though the EPA has reported annual averages less than the standard of 8ug/m3 there will be higher levels in certain locations across Melbourne. Mr Morris suggested that vehicle emissions come from more than one source and emission reductions should be achieved in the most cost effective way and this is likely to be at the tail pipe. However, Professor Irving responded by saying that if that had have been practical it would have been done by now. Professor Irving believes that the strength of the data indicates that an increase from 6-7ug/m3 would increase risks to health and that we cannot claim to have clean air in Melbourne because of the lack of long term (10 year) data for PM2.5 and the lack of monitoring points. Krelle and the Association recently worked with the City of Melbourne to resolve the Return to Royal Park issues for the area south of the Royal Children Hospital. Krelle says Royal Park should be considered as sacrosanct and no part of the park should be used for any tunnel. The embankment of remnant vegetation reminds him of growing up near the Grampians and believes that it is obviously a classic Australian landscape, which is just beautiful. Charles La Trobe established the park in 1854 and since then it has been whittled away at the edges. It is time to draw the line. There are options for the road available that could save a very special park that has been home for Australians for 30,000 years. 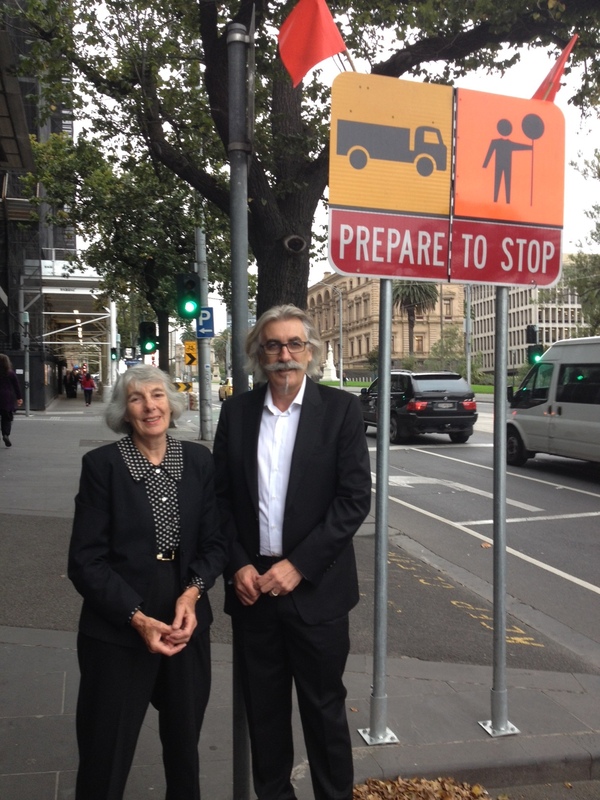 Lucinda Peterson and Christopher Peck are Manningham St, West Parkville residents who propose that the CIS does not adequately consider the impact on open space. They recommend that the project boundaries be expanded to consider the sensitivity of the areas. Compares the treatment of EastLink to that of EWL with respect to compensation. Considers that the current Urban Design Framework has set the bar too low; and alternate options have not been considered sufficiently. 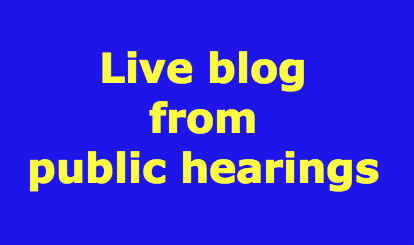 Considers that West Parkville residents have been left out of LMA and MCC considerations. The residents were so concerned that they engaged their own expert witness. These residents consider that the UDF is simply opportunity to hide the road design deficiencies – such as simply planting trees etc. Suggest that the EWL reference design is simply the cheapest. Makes recommendations for a revised UDF framework. 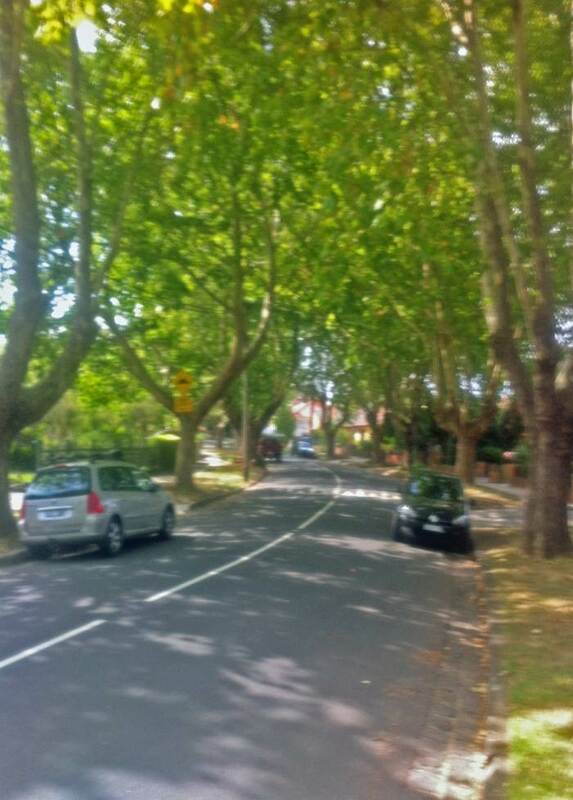 Anthony Peyton highlighted the anomalies in map books and requests LMA confirm that all Elm Trees in Flemington Rd are to be retained. Peyton requests further information about how to do a right hand turn into Elliot Ave from Flemington Ave. Requests from LMA confirmation that no fly-over is proposed for the Elliot Ave and Flemington Rd intersection. Requests LMA confirm the traffic flows that are proposed for Lennon St. to provide resident access – especially westward as they currently do. The betterEWLdesign comprises Safety Net for Royal Park and Atelier Red + Black. Option 1 – portal on west side of Flemington Rd. This option attempts to maximise under-utilised space within the current CityLink boundary – for example using space under the existing CityLink. Believes CityLink left space to enable such future options. Also utilises under-utilised commercial open space. Suggests that benefits include; Royal Park intact, 55 homes saved, 4 sports fields saved, no impact for SP Ausnet or Seeing Eye Dogs etc. Debney Park retained. Option has same road length, improved traffic flow, less residential compensation, and would see Arden Macualay enhanced. Presents documents from 2012 that show EWL on east side of CityLink. Believes that options such as this should have been considered by the LMA. This is the group’s less preferred option but is within the project boundary. They believe this option is less intrusive than the Higgs option. Demonstrates how the Australian Institute of Landscape Architects concerns can be incorporated. A version of these designs have been with the LMA since June 2013.
that a supplementary CIS should be prepared on the most triple bottom line version as a project rather than a reference project and LMA define their interpretation of ‘avoid’. Day 23 will be the third day of the community group presentations and will have a strong focus on Royal Park, West Parkville and Moonee Ponds Creek, some of the areas to be most poorly impacted by the LMA’s reference design with the proposed destruction of a heritage park, 55 residences, four sports fields and the CBD’s last remaining tract of remnant vegetation. Neil Morton will kick things off representing the University of Melbourne Baseball Club. Ross Straw Fields is facing destruction and includes Melbourne’s first baseball field. Neil has been fighting this project since the start. Kelly Wright and Les Potts, representing the Flemington Association, will then highlight the significant impacts that would be felt by the Flemington community including the Flemington Housing Estate and the new playground in Debneys Park. Tony Smith has been serving the interests of the Moonee Ponds Creek for a long time and this will be a presentation sure to be filled with thought provoking ideas of the value and more importantly, the potential value of the creek. Kaye Oddie and Gordon Ley will represent the Friends of Royal Park and will be covering the biodiversity and habitat impacts that would be associated with the reference resign and proposed project boundary, as well as the severity of plans for the cut and cover to be used to construct the tunnel through the park’s heart. The Parkville Association will be represented by President, Robert Krelle who will stress that it is against the principles of a modern proud city for a freeway to be built on public land and cause visual pollution and a loss of amenity for future generations. Lucinda Peterson and Christopher Peck are representing the owners corporation of 46 Manningham St and they will be highlighting the environmental and social impacts that would be felt by the West Parkville community if the project went ahead. The day will be concluded with a presentation by Anthony Peyton, representing the Safety Net for Royal Park, who will look at why alternatives otherwise not presented in the CIS and will present the alternative design that has been developed by the group.